Working with our pellet mill is unique. The rest of the material is returned back via an overflow system to the feeding hopper, so the material continually circulates through the feed system. The overflow system and the feeding hopper are a closed circuit which reduces dust particles and product waste. Material fed through the dosage system can be mixed with other added components i.e. water or other fluid, via our unique moisture dosing system. It then falls directly to the granulator. By means of high pressure and temperature the granulized material is partially plasticized while going through the granulation matrix. Consistently shaped pellets are created as the material is forced through the matrix (or dies) at a certain pressure. The pellets fall through to a sorting apparatus where granules are separated from the dust and non-standard granules. After going through the sorting apparatus, the pellets are cooled down, which prevents them from falling apart later due to overheating. Our pelletising unit is without compare in the marketplace today, with it's unique design, size and technology. Our pellet mill is a pellet machine which produces up to 450kg/h of pellets per hour and is designed to run 24/7 if required. 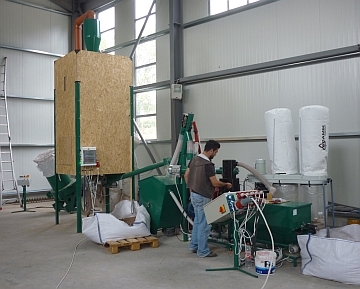 This pellet mill will start showing a profit within 6 months. 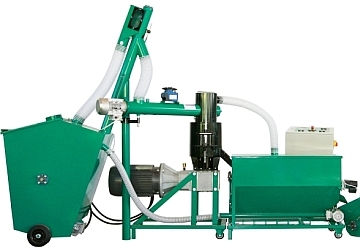 The Unique design of the auger-fed system along with the closed feeding hopper and continuous circulation of the material ensures that the feed stock is accurately fed into the pellet mill. A specially designed stirring mechanism in the pellet mill ensures the perfect flow of material to the feed arm where the granulated material is mixed with water, or with other components, i.e. lignin, molasses, oil, or vitamins for feed pellets etc. Our pellet mill = Two machines in one! - A pellet sorting apparatus ensures that processed granules are air cooled and cleaned before they leave the system - thus eliminating the need of a separate cooler and screen. Just 63 Amps is sufficient to operate the whole pelletising unit. Proudly engineered, handmade and assembled in the heart of Europe-Czech Republic. For more information, please contact us. 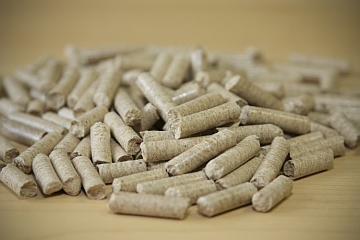 We offer equipment for pellet production and for processing pellets.